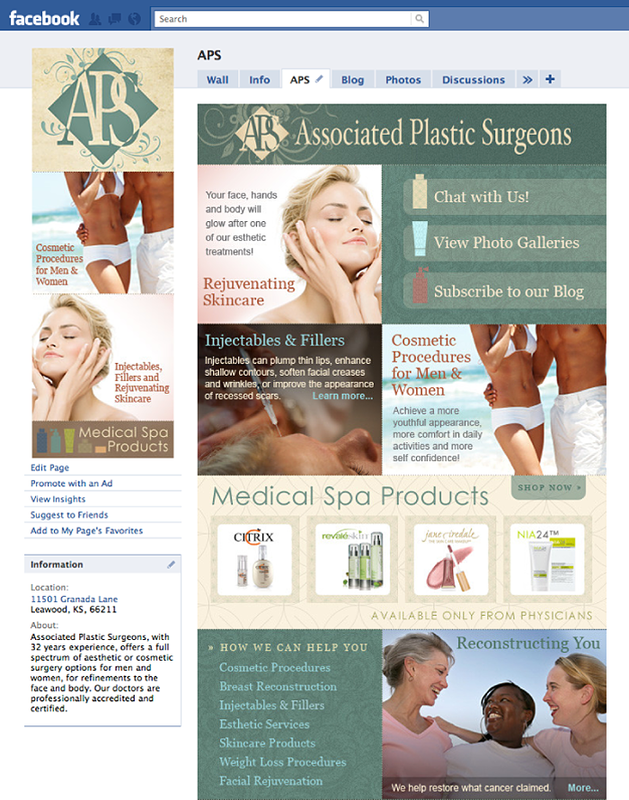 The Associated Plastic Surgeons brand identity and website redesign was truly the end result of a great team effort between a group of us here in Kansas City. With an SEO expert, a user experience designer/brand identity expert, a seasoned project manager and bizdev expert, a talented front-end web developer, an amazing photographer and a client willing to revamp their entire brand and catapult themselves forward, how could we go wrong? In every area we’ve been able to improve the site traffic, SEO, tradeshow collateral and ecommerce site since launching in 2009, in addition to providing the client a WordPress-based CMS platform that allows them to make easy changes to copy, photos and to blog, something they did not do before. 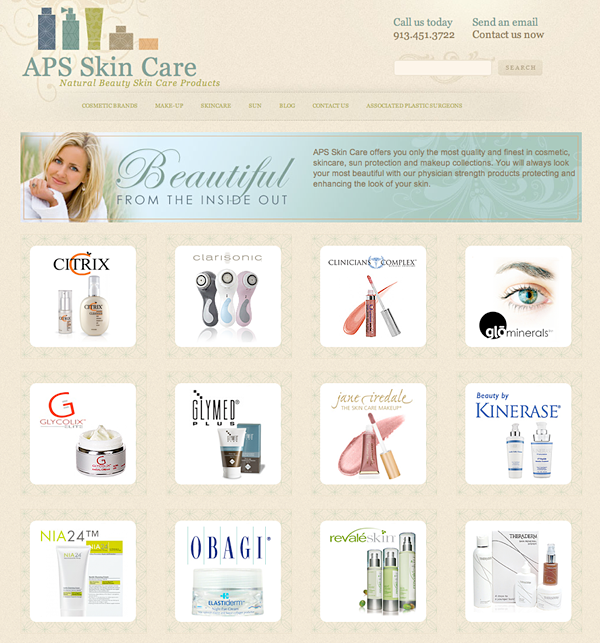 We completely refurbished their online store also, where they sell physician-grade cosmetics and skincare products. The store is using the WordPress e-Commerce plugin with some tricked out ways of doing variations, and we’re really pleased with how it’s come out! We also added a slew of social sharing capabilities – prior to this redesign the ecommerce store had no variations shown, was difficult to add new products to and offered no sharing or descriptive capabilities. One of our favorite things about the new site is the special logo and identity for the ecommerce store. We did the store under a separate domain name so that we can do Google ads or point people directly to it (bypassing the main website) yet the navigation in the header on both sites seamlessly moves you back and forth. We made this site a rich cream, as opposed to the green APS website, to distinguish them. We found some unique patterns to use inside the logo and for the frames around the product images, and we also like using it as “wallpaper” behind the logo bottles as they appear to sit on a shelf (see the postcard used to announce the site launch.) It’s the little things that give this store the stylish appeal we felt it deserved and that buyers wanted to see when shopping for beauty products. We also designed collateral for use at the annual Holiday Mart tradeshow. We designed a backdrop banner with their logo and the textured background we used for a postcard handout. It came out really beautifully!